Prepared using unsalted butter, nonfat chicken broth, nonfat milk and 1 Tablespoon each of cheddar cheese, bacon and green onion per serving. Sodium may be reduced by using low sodium chicken broth. Bake potatoes at 400 degrees F. for 1 hour or until tender when pierced. Peel when cool enough to handle. Melt butter in dutch oven over medium low heat. Stir in onions and garlic, cover and cook 10 minutes just until tender. Add two of the peeled potatoes and mash with a potato masher. Add broth, milk, salt and pepper. Bring to a simmer, stirring occasionally. Cut remaining potatoes into small cubes. Add to soup and stir gently until heated through. 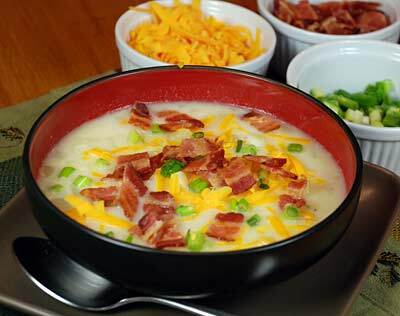 Sprinkle each serving with the toppings of shredded cheddar cheese, cooked and crumbled bacon and green onions.